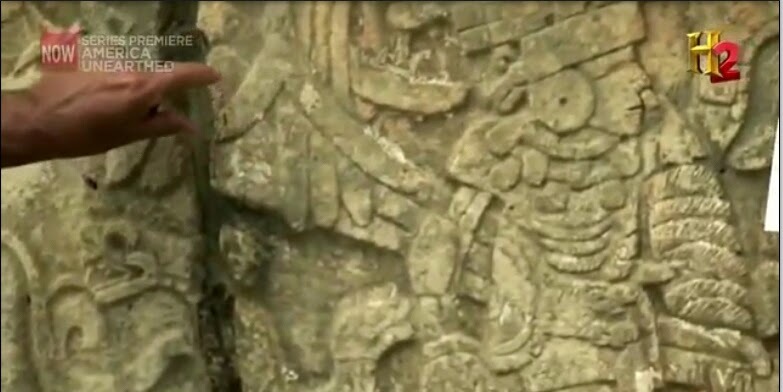 American Mayan Secrets is the first episode of the series America Unearthed, originally aired right on 12/21/2012. Honestly, after watching a season and a half of this show, it is not the greatest pseudo-documentary. But I am going to start reviewing Meso-themed shows, so I'm going back to this one. In this episode, Scott Wolter, the forensic geologist host, wants to explore the supposed Mayan pyramids found in Georgia. He begins by complaining and swearing that the "government" wouldn't let him into the site, but a friend of his has secret footage. The photographer had a permit and spent a day filming. There are over 100 rock walls and structures on the site. To me, they look much like the rock walls found all over New England (where I live). There are also cairns, not dissimilar to those at nearby Gungywamp (probably built by Native Americans or at the latest, early Colonial settlers) in Groton, CT. But best of all, the photographer found a square foundation. Clearly, a pyramid was there, according to Wolter. That sends him off on a quest. His photographer puts him in contact with Richard Thornton (quoted at the above linked article and here), who is the one who discovered the supposed Mayan connection. Wolter brings up one of his favorite subjects, archo-astronomy, and Thornton promises to show Wolter all sorts of maps and diagrams with alignments at the Georgia site. Wolter immediately wonders, "is this what they don't want me to see?" Thornton says there are over 3000 stone structures, carbon-dated to 1,000 AD, a whole town's worth (see map) more than a half-mile square. Thornton is flabbergasted that archeologists formed a "political action group" to "opposed" all information about this site being related to the Mayans, without ever seeing the site in person. (Apparently this is that cabal?) Wolter is not surprised. He goes into a long digression about another investigation he went on that was also stonewalled by academics. When Wolter shows Thornton the videos shot by his friend, he admits to be "not impressed" because the ruins don't really look like anything from Mexico. The stones aren't dressed or neatly stacked, there is no stucco or plaster (whatever they called it back then, same form and function). Thornton says that all Mayan sites really look like this, and people like him (he is NOT an archeologist, by the way) are called in to rebuild them. I think that's pushing it a bit. I've been to some sites where stuff isn't restored, just dug up, and it looks more organized, and very different, than these familiar rock walls (which I have seen all my life all around me). Thornton has a lot of really cool 3d videos showing various archeo-astronomy alignments he's discovered that don't lend themselves to screen printing. He says he also found a water distribution device that convinced him the site is Mayan, because the Maya grew crops on terraces and water through artificial irrigation. Once again, Wolter complains about not being allowed admittance to the site and says petulantly that he'll just fly in and use LiDAR on the site. Apparently you can just fly over places and use this ground-sensing technology with no permissions? LiDAR is something that's also being used in Central America to find archeological sites from the air, since the squared outlines of buildings show up clearly even when buried by vegetation. It is also really, really expensive. I can only guess that the production company is paying the bill; I found one LiDAR survey that cost $80,000 (lower right corner of page 3). That segment of the video is called the LiDAR Aerial Reconnaissance Mission over Chattahoochee National Forest. I cannot make this up. While in the plane, Wolter earnestly explains that around 900 AD, the Maya people "just vanished" and that "many believe they came to America." This is the same kind of fudge-writing used extensively on Ancient Aliens; it actually says nothing. The millions of Maya still living in Mexico might take offense at being told they vanished 1100 years ago, for instance. There's an overly long segment about how exactly LiDAR works, including the "mowing the lawn" pattern also used when doing underwater surveys. (Maybe he should have done that when looking for the underwater Aztec pyramids instead of giving up like a wimp.) 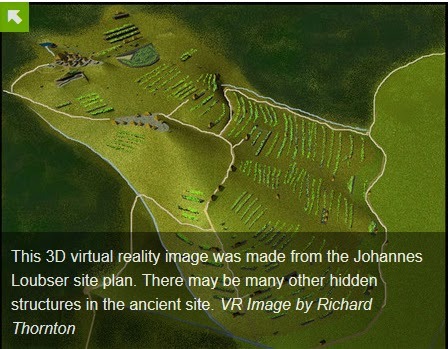 The LiDAR stuff is very interesting and I'd watch a show just about how it works, but it takes too much time away from the meat of the episode: is this settlement Mayan or not? Wolter says that he was "very skeptical" but now, seeing preliminary LiDAR images, he is "convinced." He muses that the flight of the Maya from their cities to Georgia might be "connected to their prophecy" and heads off to another location to look at a carved rock called the Forsyth Petroglyph in Athens, Georgia. This stone, the petroglyphs of which are reproduced to the right, has nothing on it that looks Mayan. He meets with another source, who wrote a book about the Maya, who says the symbols are EXACTLY the same as Mayan symbols as well as Creek symbols. 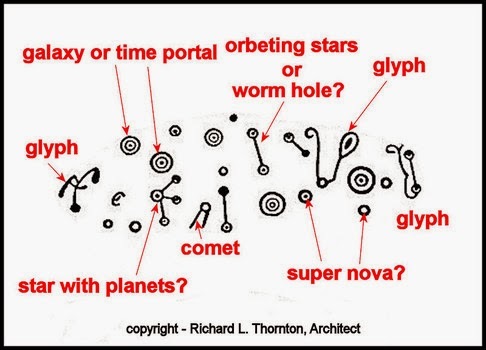 Supposedly the carvings are of star map, a comet impact in 536 A.D. Wolter agrees that it must be a star map and also that it's clear that it connects the Creek Indians to the Maya. No mention of why this comet impact is so important or where the comet landed. I was able to find out that there is global evidence that something happened around then, but it was probably a large volcano, maybe Krakatoa, erupting. Or why the Maya made a carving in 536 AD in Georgia when they were in Mexico until after 900 AD. Or how there can be a "star map" to a volcano located right here on Earth. Then they get into the most interesting (and in my opinion, valid) part of the show: Maya Blue. 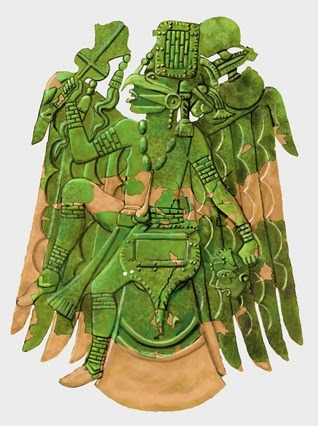 Maya Blue was a special blue (green-blue, really) very durable, pigment used extensively by the Maya in their murals. It's a mixture of palygorskite clay and indigo pigments. The clay is abundant in Georgia but not in Central America. Wolter thinks that the clay from Georgia was used to make the pigments used in Mesoamerica. 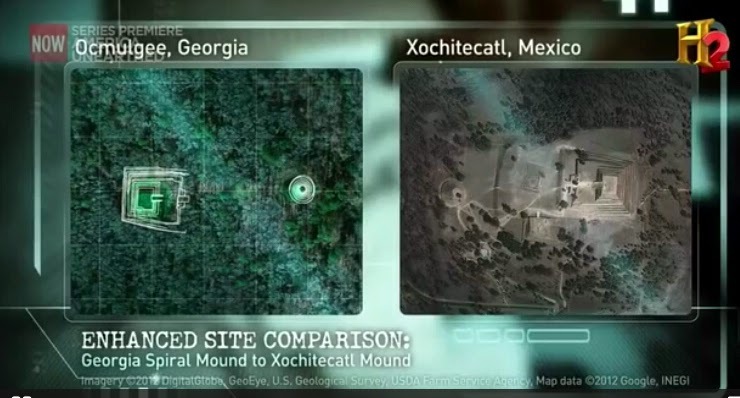 The source offers another connection between the two areas, and displays photos and sketches of a "falcon dancer plate" and says the identical drawing was found at Chichen Itza (more on that below). The source also says that at another Georgian site called Ocmulgee they found an "elite burial" where the skull had cranial deformation. (I wrote about cranial deformation a few years ago.) The source brings up again that it's "taboo" to mainstream archeologists, and again Wolter whines and says he's going to change history himself! To the bat cave! I mean, off to Ocmulgee Mound Site (Macon, Georgia) to see the deformed skull. En route, this source says that Thornton's theories need to be tested, but the horrible academics won't allow it to happen. The focus then moves briefly to Florida. When the Spanish arrived in what is now Florida, around Lake Okeechobee were three tribes, called the Mayaimi (Miami is actually not named after that tribe), Mayaka, and Mayauaca (which doesn't apparently exist except on this program), and some research shows me that none of these tribes were remotely related to the Mayans except their names. Wolter takes this as further proof the Maya were in Georgia. They inspect a large mound in Ocmulgee, supposedly the first one built by the Creek upon their arrival in the area. It's a large mound with a central hallway, the door facing due east to align with the sunrise. (Looks more like an English barrow to me than anything MesoAmerican, but what do I know?) This is Wolter's dream, archeo-astronomy. This cannot possibly be a coincidence. Wolter asks what the archeologist thinks about contact between the Creek and Maya, and he says "it's possible" which really floors Wolter, who was obviously expecting a fight, but the guy is very personable; he grins and says "if you can find the Maya there, we can find Georgia down here." They look at the Observatory and talk about how the various windows were used to track Venus and other alignments, and also was related to the calendar. The building is the link between the heavens and the earth. 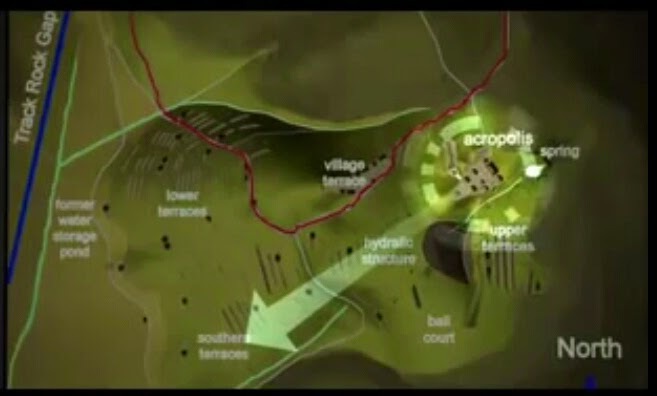 Wolter tells how he saw a spiral mound in Georgia, and there are spirals on some of the carvings at Chichen Itza, so clearly they are exactly the same. The archeologist is non-committal. Wolter pulls out a nautilus shell and insults the archeologist's intelligence by explaining the Fibonacci sequence and tells him that the Maya were copying it. 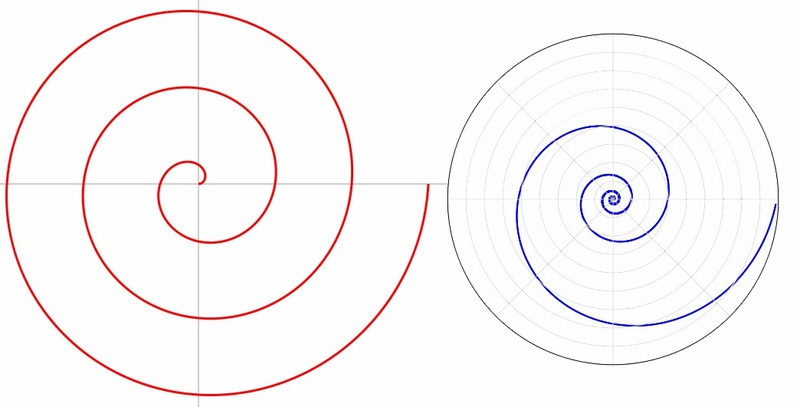 Even though a Fibonacci spiral is not the same as the spirals they drew. Wolter brings up the "end of the calendar"and "end of the world" (this was filmed in 2012) and the archeologist calmly says that it's the end of Baktun 12 and the beginning of Baktun 13, where we will stay for 400 years until Baktun 14. It's the beginning of something new, and it's great that it gets the Maya people more attention. The archeologist shows Wolter a carving that is similar to the Falcon Dancer plate. They are both carrying weapons, both appear to have feathers, and both have a severed head. I think it's the temple of the Warriors, but it's been a while since I was down there. Finally they return to the subject Maya Blue, gazing over the cenote, the ritual well, and the place the site is named for (Mouth of the Well = Chichen Itza). The cenote had children at the bottom (sacrifices to the rain god) and a lot of Maya Blue, a 14-foot layer of it, from all the offerings painted blue before being tossed in there. What's left of Mayan Blue looks rather green after 1100+ years in the elements, but some of it is still visible. The archeologist admits they haven't found a single source of palygorskite for the Maya Blue but it doesn't seem to faze him. Wolter returns to his lair, I mean lab, and reviews the LiDAR data. He seems astonished that the reconstruction (above) matches the LiDAR. The guy meticulously mapped the place by hand, why wouldn't it match? 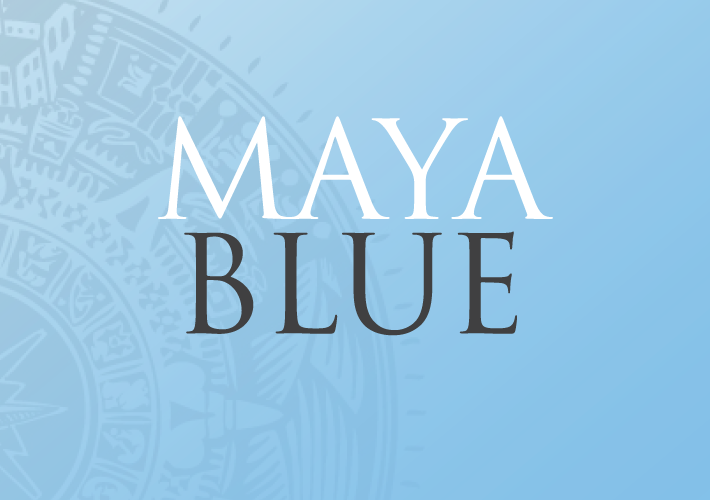 Wolter creates some Maya Blue using Georgia clay and compares it to actual Maya Blue used in Mexico to see if the clay is geologically the same, using x-ray defraction, and find that it matches perfectly. Wolter then goes on a tirade about how "academics" don't believe any cultures came to America before Columbus and that it's bullsh-t and this PROVES them wrong. Um. Columbus himself found all sorts of people already here when he arrived. I wasn't aware that any academics disputed that. Even a first grader knows that. There is resistance to the thought that Europeans came here before Columbus (or even Asians, discounting the land-bridge part of it 40,000 years ago). I do think the connection between Georgia clay and Maya blue is awesome because it proves that TRADERS moved between the two. It makes NO SENSE that the Maya fled FROM Mexico TO Georgia and yet used Georgian materials back in Mexico.